Entering service in 1972 the Citation is a small, fuel efficient jet, designed for economical performance. Targeted primarily to the Owner Pilot, the Citation focused on docile handling characteristics, rather than fighter-jet qualities. By the end of the 1970’s, the Citation vastly outnumbered any other make, worldwide. It also became the first business jet certified by the FAA for the “Single Pilot Exemption”, making it well suited for the Owner Pilot. 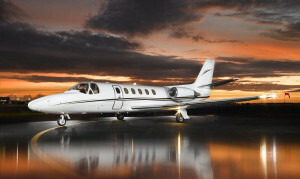 The base version of the Citation served as the platform for a series of variants offering increased performance and capabilities. We also have Citation Mustang Type Rating which was launched in the very light jet category by Cessna. PJT’s signature course “ the 5 Day Initial” covers all legacy Citation training. Your first three days consist of classroom ground school including aircraft systems, weight & balance and performance. Daily systems intergration is conducted in our simulators and actual aircraft, where you experience a real “hands-on” preflight walkaround. Flight training is conducted in our Citation 550 company owned aircraft or your own and our new citation simulators. Each flight and or simulator session has a one hour pre briefing followed by a two hour lesson and a thirty minute de briefing. Each simulator session allows students/instructors to record and playback each session through the Insight program. Cygus is also available allowing iPAD use with Foreflight during your sessions. PJT’s recurrent training course is designed for the clients needs and can be completed in one to three days. Refresher ground school ends with a written exam. Simulator sessions are customized to meet your individual needs. Finally, your 61.58 proficiency flight is completed in our actual aircraft or yours. For your convenience, recurrent training is eligible to be conducted at your location. Our unique advantage to single pilot exemption training is the ability to complete your curriculum in conjunction with your Initial or Recurrent training course. Unlike Part 142 training centers where you must complete a separate training course after your initial training is completed. This course can be added to an existing CE-500 PIC, upgrade or recurrent type rating course and is also eligible for completion at your location. The single pilot exemption allows the pilot to fly any CE500 series type rating series as a single pilot.